Aggression problems in cats are an issue if you are on the receiving end of it. Although cats don’t usually cause fatal wounds, people can be seriously injured. In fact, cat bites are quite dangerous, because a cat's sharp teeth can puncture the skin very deeply and cause an infection! Before you assume your cat's aggression is a behavioral issue, though, the first thing to do is to have him examined by your veterinarian. A medical issue may be the problem. For instance, your cat may be in pain or not feeling well, and he wants to be left alone. Similarly, certain conditions can make cats hyperactive or agitated and restless, which sets them up to be aggressive. Once you've ruled out any medical problems, you will need to address the aggression as a behavioral problem. Learning cat body language is important for cat parents. It helps to know what your cat is telling you. 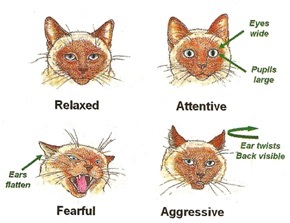 Cats’ signals are often more subtle than dogs’ and that can make them harder to interpret. Pay attention to the tail and ears. You can avoid many problems if you learn to “read” your cat and stop before he lashes out. Often he’s telling you to “back off”, but you just aren’t getting the message. If your cat has been aggressive, think about the situation surrounding it. What was going on at the same time? What happened just before? Where did it occur and to whom? Answering these questions can help you figure out what might be triggering the problem. That will help you decide the best way to improve the situation. Also, work to decide whether the problem is true aggression. Some aggression is actually rough play. These kittens and cats haven’t learned how to inhibit their behavior to avoid injuring people. Often the cats seem to get “wound up” and go overboard. They often pounce on people because they are stalking you, as they would stalk prey. This is the most common type of "aggression" that cats display to their pet parents. If you determine that your cat's behavior is actually rough play, try to redirect your cat’s attention away from you. Carry a toy with you to throw if your cat likes to pounce. Don’t wrestle with your cat or play in a way that overexcites him. If he is wound up, throw a toy or move away from him. Two unneutered males are especially likely to fight and neutering them is the first step. Often that will take care of the problem. Within a household, cats often resolve their differences before fighting. One cat may back off when another is threatening and nothing further occurs. However, in some cases, there may be conflict that you need to stop. Should this happen, it's important that you intervene as calmly as possible, using something like a pillow gently inserted between the fighting cats, so as to not make the situation worse or run the risk of getting yourself injured. If you are introducing a new cat, do it very gradually to avoid triggering aggression in the first place. There is a synthetic feline facial pheromone, Feliway®, that can help ease anxiety and fear. Often this will help cats to accept each other. Some cats will become aggressive when they are afraid, especially if they can’t escape. Others will fight to defend their territory. This can happen when a kitten reaches maturity, a new cat is introduced into the house, or there are cats roaming outside. Cats will sometimes attack for no apparent reason. Often this is due to “redirected aggression”. This happens when a cat gets upset at an animal or person he can’t get to (often from looking out a window). He then attacks whomever comes near him. There can be some delay between the initial trigger and the attack, which complicates figuring out what is happening. It can be very serious as these cats can be very agitated and attack aggressively. If your cat is growling or acting upset, don’t try to pick him up or calm him down. Stay away from him until he calms himself down. If cats or other animals seen outside upset your cat, try an automatic sprinkler to keep cats away. Blocking views from windows might also help. Put an opaque film on windows or pull down blinds and shades. Some cats will become aggressive when you are petting them. Cats all differ in how much physical contact they enjoy. The key to preventing this problem is to watch your cat’s body signals and stop as soon as he starts getting agitated. If he lays his ears back, starts swishing his tail, or quickly turns to look at your hand, stop! Some cats will tolerate petting on certain body parts but not others. Learn what your cat prefers. This is the easiest aggression problem to resolve, assuming you pay close attention to what your cat is telling you. However, some cat parents are disappointed to learn that their kitty doesn’t want much affection. In this case, you can gradually get your cat used to more petting. Find out how many strokes she will tolerate before getting upset. For instance, if you can pet her 4 times, pet her 4 times then give her a treat and leave. After a week or so of this, see if you can pet her 5 times and give her a treat. You can often gradually increase the amount of petting she’ll tolerate if you go slowly. 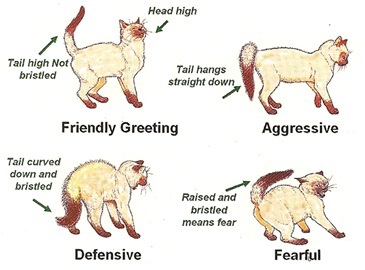 These are the common types of aggression seen in cats. Some of the situations will improve by paying attention to the signals your cat is giving you and stopping problems before they occur. In other cases, you can prevent the things that will trigger the aggression. However, if a cat threatens children or fragile adults, or if someone is afraid of the cat, the situation is serious. Fear from you, your children, or other members of the household will often just make the aggression worse. You need to take steps to improve the situation and to control your cat’s aggression. You should consult with a trusted veterinary expert or an animal behavior specialist if you are not able to resolve the problem on your own.